Today was a beautiful day. Not just because the weather was amazing but because I was able to spend time with my family. 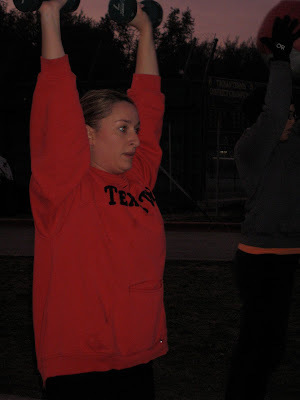 I started out, along with a handful of other coaches, supporting and encouraging eight teams in a Relentless Boot Camp Challenge that took place at town lake. Teams of three competed against one another and themselves to win not only today but a competition that has been going on for the last seven weeks. Men and Woman changed their lives to reach weight loss goals, fitness goals, and even some personal goals during this 8 week time. The results were amazing! My team alone lost over 6 % body fat, 15 + total inches and the before and after pics are even more amazing. (They will be posted soon) Then to the house for breakfast with the family and off to support my husband Kris and many other CrossFit athletes at a clean and tire flipping contest at the Hyde Park Gym. I was signed up but an ankle sprain from earlier in the week kept me out of the competition...arrgh! Nonetheless everyone did a great job, Kris had a four pound personal record and was able to get a 630 pound tire flipped eight times in one minute! Nice job to all the competitors. I had also signed up for the Rogue trail race on Sunday but had to pass that off to Kris as well due to the ankle. The kids and I spent a few hours in the yard. I sprayed them down with the hose, read a little in a book, and even got a little yard work in. Then a quick workout on our home's porch, to make sure that I haven't lost anything. What a day! I was surrounded by people that give 100% of themselves by creating and achieving the life that they designed. What is better is that my children are always around these folks. With this sort of positive influence around them, my children will see possibility and achieve their dreams...whatever they may be. Spring is here and I am HAPPY! For those that know me... know how cold I get, my fingers go numb, my toes go numb, my lips turn purple, and I chill at the bone; therefore the SUN makes me happy. It is well known that the sun's rays are a good source of vitamin D, which is essential in building strong bones and teeth. In addition, research suggests that low vitamin D levels may increase the risk of type I diabetes, muscle and bone pain, and again, certain types of cancers. It may also help normalize your blood pressure. In addition, the sun raises your levels of serotonin, which elevates your mood. Some people who suffer from depression or mood swings can benefit from exposure to UV light. So get out in the SUN! 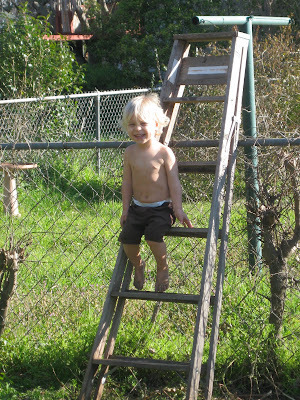 It is know in my house that if the Sun is out then we are naked, well, almost, in the back yard getting our sun on!!! It's the simple things that keep me happy! Coaching completely outside 2x's a week is a great change for the CrossFitter! We use everything around us and then the tools that so conveniently fit into the back bed of my truck! 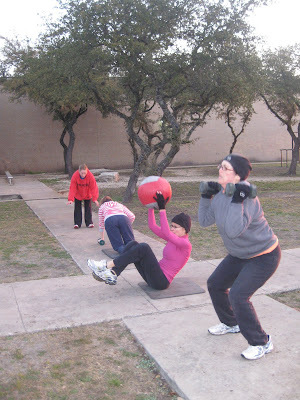 I Have a great group of Women out every Tuesday and Thursday at 6:15am. If you are ready to shake it up come out for FREE this next week to the North SIDE boot camp on Steck and Mesa at Anderson High School! We will be doing some mad met cons!